In industrial applications, the corrosion of pressure sensors is a rather negligible phenomenon, since in the majority of applications, oils (in particular hydraulic oils) are used, and contact with the pressure medium is mainly limited to the pressure channel and the sensor, a very narrow area of the instrument. In level measurement with submersible pressure transmitters, however, the instruments are fully and permanently in contact with, often, water-based media. Here, as a result of incorrect or total lack of grounding, or insufficient equipotential connection, strong corrosion and impairment of the correct function of the level probe can occur. 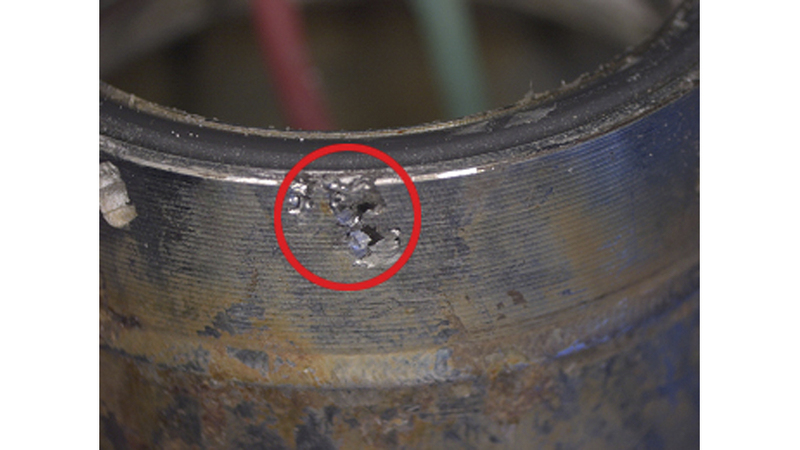 Corrosion of a submersible pressure transmitter almost always leads, specifically due to their design and application, to moisture-related sensor failures. The types of corrosion with submersible pressure transmitters are in the rarest of cases only limited to pure surface corrosion, which is mostly a result of an unsuitable housing material for the specific medium. Most commonly, pitting or crevice corrosion occurs. This leads to punctiform corrosion, penetrating deep into the material. These forms of corrosion often quickly lead to material removal through the entire housing wall and eventually result in full moisture ingress into the body of the submersible pressure transmitter. The penetrating moisture then results in damage to the electrical circuitry and ultimately leads to the failure of the pressure sensor. Common submersible pressure transmitters on the market generally include an earthing concept based on a revolving screen or braid within the cable sheath. This serves as a screening for the individual wires against interferences (of the cables partially laid on the surface) and also to earth the level probe. Submersible pressure transmitters are often used in water-based, conductive media. Due to the electrical conductivity, the medium/water surrounding the submersible pressure transmitter can lead to the formation of a galvanic element. The galvanic element is formed here from the mostly metallic tank wall and the metallic housing of the submersible pressure transmitter. Therefore, it is important that the submersible pressure transmitter is connected to the same earth potential as the tank. Otherwise rapid corrosion of the submersible pressure transmitter can be caused by earth equalisation currents. If no equipotential bonding is provided, the potential difference between the probe, the liquid and the tank wall can cause parts of the body material of the submersible pressure transmitter to dissolve electrochemically and thus an active material removal will occur. Corrosion caused by transient currents does not only occur in metallic containers, but also often when the submersible pressure transmitter is mounted in isolation or in deep wells. This produces local galvanic elements, as a result of the smallest of structural differences which exist in all materials, in the housing of the submersible pressure transmitter. These local galvanic elements will also cause transient currents on the surface of the housing of the submersible pressure transmitter. In both cases these earth equalisation currents or equipotential equalisaton currents generally lead to pitting or crevice corrosion on the chemically most ignoble area of the submersible pressure transmitter. This material dissolvalon, quite literally, the weakest area of the housing leads to corrosive attack, limited to a very narrow but still extensive area, and eventually to sensor failure. Therefore, it is recommended that every time you use a submersible pressure transmitter in conductive media, you should provide an appropriate earthing concept with full equipotential connection in order to avoid early and costly product and production losses. WIKA offers comprehensive solutions for your hydrostatic-pressure level measurement. For further assistance in selecting the pressure sensor most suitable for your application, please use our contact form.